"Katahdin Iron Works, Brownville Junction Jitney "
An image scanned from a black and white photograph that looks like a reproduced page from a scrapbook. The scrapbook included a handwritten caption under this photograph to read, "Homeward Bound Sept. 1923." 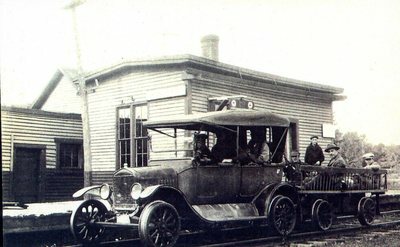 The vehicle in the photograph is a jitney, the body of a truck or station wagon, with a Model T engine, mounted on rail wheels so that it could run along railroad tracks.